Introducing the Recto®-Verb™ Twenty-Five Head and 1x12 Combo. These are the Reverb-endowed, fraternal-twins of our little Mini Rectifier® lunchbox that’s been taking names all over the globe. These even mightier packages are slightly larger - just big enough to accommodate a 1x12 speaker in the case of the combo and long-spring Reverb tank in the case of the head. In both cases they boast all the same great performance that the Mini Rec™ is famous for and more. Plus, their classic vinyl-covered birch cabinets provide a wide array of custom finish options to fully personalize them. We keep saying it, but it’s hard to overstate the value, effectiveness and stylistic "power" of the Multi-Watt™ Channel Assignable Power switches. These dedicated wattage range choices unveil different power characteristics and colors - so they are really power "voicing" switches as well. In this Recto®, the choice of EL-84 power tubes with their amazing clip characteristics, prompted us to explore the different wiring schemes possible. This experimentation led to the 10-Watt Power Mode being wired for Triode operation. This "more vintage" wiring scheme sweetens and rounds out the sound, turning what might otherwise be a lower volume version of the same voice, into more "soulful" Recto experience. The Recto-Verb 25 also features our all-tube, fully buffered Effects (FX) Loop wired in series to provide added flexibility and ease of use - But most importantly, we designed the Loop circuit for TONE! 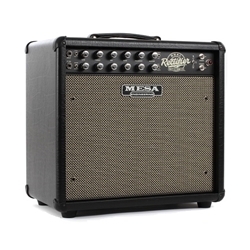 Mesa/Boogie® actually invented the concept of incorporating an "FX Loop" into a guitar amplifier decades ago and we've worked tirelessly to perfect it. It’s important that the Loop enhances the overall tone of an amp rather than detract. So whether you're rockin' out or putting the immense versatility of this new Recto’s four Modes to task on a variety of styles, you’ll find inspiration and a huge fun-factor in these exciting, super-portable 1x12 Combo and Head packages. Experience Tone and Power that far exceed your expectations and completely defies the confines of its physical size. Visit your local Mesa/Boogie® Dealer and get yourself plugged-in to the amazing Recto-Verb Twenty-Five!